Are you re-stringing a piano? Would you like to be able to do all the calculations in seconds instead of hours? 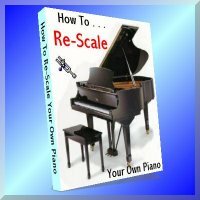 I have written a piano scale design program that will do all the calculations for you quickly & easily. Tension: String tension should be maintained below 60% of breaking tension. Hammer/String Contact Time: This factor should increase gradually from A1 - C88. The larger the number, the faster the hammer will rebound from the string producing a larger percentage of upper partials. Unison Loudness/Sustaining Factor: This factor should decrease smoothly from A1 - C88. The larger this number is, the louder but less sustaining will be the tone. String Inharmonicity: For the purposes of scale design, inharmonicity is usually calculated in the 4th partial. Inharmonicity should decrease gradually from A1 to the bass/treble break, and then increase gradually & smoothly to C88. Priorities: Sometimes it is not possible to get all three of the above calculations to progress smoothly and you must be satisfied with a compromise. In such as case, follow the following priorities. String Elongation: This should also change smoothly throughout the scale, which aids in good tuning stability. This measurement can be calculated for any portion of a string. Unwound Lengths of Wound Strings: This measurement refers to the portion of the speaking length in wound strings that has no winding on it. Hitch Pin to Start of Winding & Winding Length: This is a very useful calculation when replacing wound strings so that you end up with the proper lengths of the unwound portion of the string and the wound portion after the string is pulled up to pitch. This calculation will give you the measurements of the string before tension is applied to the string. These are the measurements that you supply to your string maker to allow for string elongation. Make sure that you state that these measurements represent the ends of the windings before the string is pulled up to pitch. Wrap Wire Size: Determine what size of wrap wire must be used to obtain the desired overall string diameter. This calculation allows for roughly a 5% distortion during the winding process. Calculations can be made for copper, iron & aluminum wrap wire. Note: I have also prepared a piano scale design work sheet that you can print out to record all of your calculations for analysis. Click here for more information on piano scale design.